ST. SIMONS ISLAND, Ga. (AP) — Cameron Champ was a freshman in high school and a graduate of The First Tee program, missing only the means to travel the country to play junior golf tournaments with hopes of getting noticed outside Northern California. One phone call made a difference as big as some of his drives. His father called John Wood, an old friend from high school in Sacramento who at the time was caddying for Hunter Mahan. Champ is a top attraction this week in the RSM Classic at Sea Island, mainly because of how far he hits the ball, partly because of the attention he gets from how far he hits the ball. He began his rookie season six weeks ago and won the Sanderson Farms Championship in his second start as a PGA Tour member. His clubhead speed has been clocked at just under 130 mph, faster than anyone on tour. His ball speed has been measured at just over 192 mph coming off the club, another head-turner. He still views that phone call as a pivotal moment. Wood made a pitch to Mahan, who invited Champ to his American Junior Golf Association event in Texas. Champ took it from there. Wood said he first called friends at Ping Golf, a big supporter of junior golf, which helped Champ with equipment. Then he talked to Mahan, who was in the third year hosting the Under Armour Hunter Mahan Championship outside Dallas as part of the AJGA circuit. The seed was planted, and the growth was rapid. He said grants from the AJGA allowed him to travel. Champ was an AJGA All-American the next two years, played in the 2012 Junior Ryder Cup team and landed at Texas A&M, where he was slowed by back injuries his first two years. He first got noticed on a big stage when he qualified for the 2017 U.S. Open at Erin Hills and led the field with an average drive of just under 350 yards. 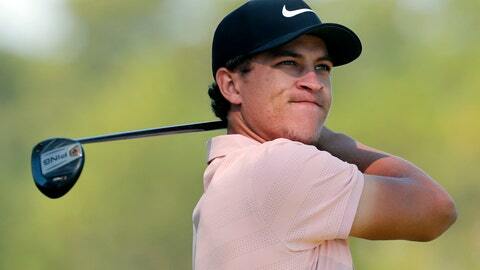 One year on the Web.com Tour the next season brought his first professional victory and a ticket to the big leagues. Everything about Champ is about big, starting with tee shots created by incredible speed without looking as though he’s swinging hard. He won the Sanderson Farms Championship by four shots with a late string of birdies. He was in the hunt last week at Mayakoba, a shorter golf course that demands precision off the tee, flighting his shots low and with movement. It wasn’t just smashing driver. He showed off an array of shots. Even so, with Champ the conversation starts with power. He tries not to get caught up in the attention, no small task considering he already has been featured in Golf Digest because of his swing speed. Starting with his power display at Erin Hills, he already is mentioned in the same category with Dustin Johnson, Brooks Koepka and the rest of the big hitters in golf. He understands why he gets so much attention, though. His goal when he earned his PGA Tour was to make all the cuts in the fall portion of the schedule, and he has done just that. The final stop is Sea Island, which starts Thursday on two courses (Seaside and Plantation) with a field that features Webb Simpson, Kevin Kisner, Zach Johnson and tournament host Davis Love III.